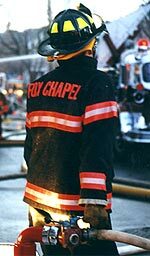 Located in the suburbs of Pittsburgh, PA, the Fox Chapel Volunteer Fire Department proudly serves the Fox Chapel Borough and its neighboring communities. The firefighters -- all volunteer -- are available to respond to fire and other emergency calls 24 hours a day. This web site has been designed to provide information to members of the FCVFD, the Fox Chapel community, and those who might be interested in volunteering. If you have any questions, please feel free to contact us at info@foxchapelvfd.com.